Moments of Mommyhood: Fishful Thinking Giveaway! Several weeks ago, I was introduced to the Fishful Thinking website by a couple of other bloggers. I checked it out and immediately realized how wonderful it is. 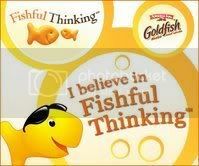 Soon after, I became an ambassador for Fishful Thinking! Fishful Thinking is a great initiative, sponsored by Pepperidge Farm, that helps parents gain the skills needed to instill optimism in their children. The site is full of activities that are designed to incorporate into every day life. I am very excited to announce that I am having my very first giveaway on Just For Fun! But it's not just any old giveaway, it's a chance for me to share the fabulous things that can be learned by visiting the Fishful Thinking website. The prize for this giveaway is a $25 Macy's Gift card! First entry: Show me what you have learned about Fishful Thinking! Go visit the Fishful Thinking website. Take some time to explore the site, then come back here and leave a comment about what you have learned. You must visit the site to qualify! *Update- Due to an amazing response to the Fishful Thinking ambassador program, they are no longer accepting new ambassadors. Those of you who earned the extra entries for becoming an ambassador will still receive those entries. This contest will end Sunday, April 12 at 11:59PM(EST). I will announce the winner sometime on Monday, April 13. They have book club discussions for moms, that's kinda cool. I like some of their activities, esp for how to help kiddos deal with frustration. Fishful Thinking is a great resource for parents and teachers. My favorite part is in the activity section: Keeping Kids Positive. I'm starting a new educational giveawy tomorrow and always have Freebie Fridays, so be sure and check my Hands On Learning Fun Blog out! I love the Tips for Parents especially about Raising a Kid Who Bounces Back. It's not about avoiding disappointments but dealing with them without melt-downs. I also loved the video for the End of Summer Party idea to reduce anxiety at the start of the school year. My daughter is always worried the days before school starts. I learned that Emotional awareness is a building block of a healthy emotional life. The more aware your child is of his feelings and the more comfortable he becomes with the full range of feelings that people experience, the easier it will be for him to connect with others. This site is pretty neat. I actually went to it the other day from your site to explore. The activities are fun. I like how they have given ideas for inside and out. The weather in AZ is so nice right now but I know in other parts of the states it is not so good. I like the age appropriate games as well. Thanks for sharing. I've been to the Fishful Thinking site a few times. I just went over and like the positive thinking activities for kids, especially about getting over frustration, which is a tough one at our house! I chanced upon your blog and visited the Fishful Thinking site this morning while my girls are still asleep. I have to say, the article on How Not to Talk to Your Kids jarred me. I have a 3.5 year old who wants to be the prettiest, smartest, and the winner at games every time. This attitude extends to her 1.5 year old sister too. This article got me thinking on how to specifically praise my older one for her effort in doing something and not relying on her 'smartness' or 'prettiness' to get her through things. It's a small step but we learn from trial and error. Thanks for sharing! PreethiM (preethip2@hotmail.com). Basically, it says if you continuously praise your child for being "smart" then they wont attempt things that they know they aren't super smart about already. Fishful Thinking is a great site! There are tons of ideas and activities. I especially liked the idea of photographing "hope." Helping the kids to get a grasp on what the meaning of "hope" truly is. I would LOVE to win a gift card to Macy's!! The "How to Be a Happier Mom" article is one that I had read before in Parenting Magazine awhile back, and it's something that I've forwarded to a lot of my new-mom friends. The whole Fishful Thinking site is great! I check out Fishful Thinking a few times. I thought it was cool they have a book club discussion sheet. The book they were showing was the Secret Life Of Bees! I was also surprised that you are not supposed to give so much praise. But Lindsey is having issues with school right now, so I don't know how to get around that. I like the tips for parents section. I know a couple who is expecting this summer for the first time and they will need all the help they can get...yes I mean it, heehee! I like the fact that Fishful ThinkingSM is a program designed to educate parents and teachers about the power of Optimism and its role in childhood development. Woohoo!! I'm so excited! Thank you so much!